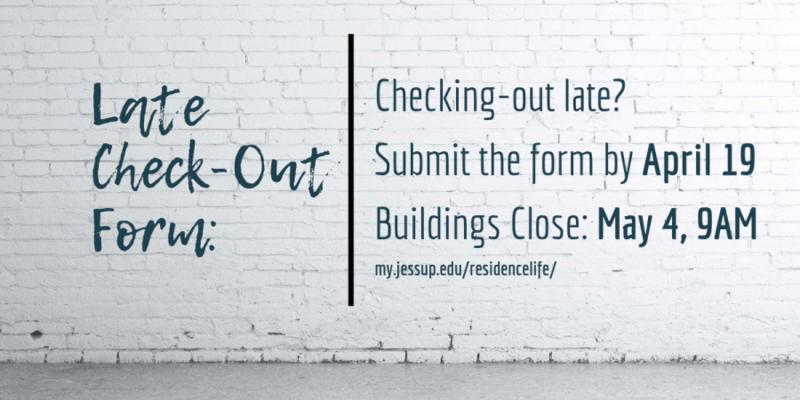 Any student wanting to check out after May 4, 9am, needs to complete the Extended Stay/Interim Housing form by April 19, 2019. Failure to meet this deadline will be a $25 late fee. Individuals who are part of the University Choir and Orchestra and are touring in May are required to fill out the Extended Stay/Interim Housing form by April 19, 2019. All items in the room/apartment must be moved to the choir practice rooms by 9 p.m. on Friday, May 3, 2019. Touring participants must complete an official check out by Friday night, May 3, 2019. The student may remain in the room with only the sleeping bag and travel necessities. All other belongings must be taken home or stored in the choir practice rooms (as approved by UCO leadership, Student Life leadership, and Campus Safety leadership). All touring UCO members will be out of rooms by May 5, 2019. Individuals who are part of William Jessup Athletics and are in season are required to submit a Summer Housing Application by April 19, 2019. Individuals who are student teaching are required to submit a Summer Housing Application by April 19, 2019. Students can stay until the student teaching has completed (no later than May 17, 2019). Residents who intend to live on campus this summer, please fill out the Summer Housing Application by April 19, 2019. « Master of Accountancy Degree Comes to Jessup!